Winter is just a memory in most parts of the country and people are rolling their grills onto their decks and patios. 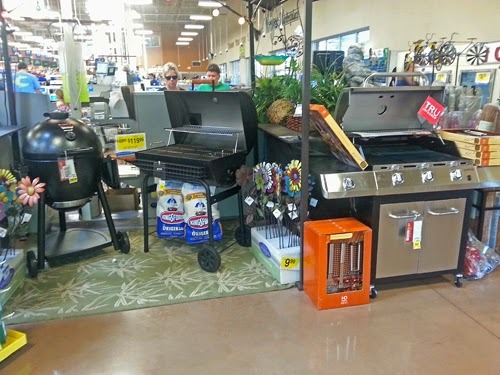 Is your grilling area up to the task or is it sad and in desperate need of a makeover? If you can't walk across your deck without shoes on, for fear of splinters from your aging deck, it's time for a backyard makeover. If you can't find your dog because the weeds are taller than Fido, it's time for a backyard makeover. If your patio furniture has more mildew than a wet towel left in your trunk for a week, it's time for a backyard makeover. If your grill has more rust than the HMS Titanic, it's time for a backyard makeover. Yeah, yeah, I know, that takes money. But if you have what it takes to be America's Top #ChopGriller, you can win $15,000 towards a backyard makeover, a large Big Green Egg in Mahogany Table, Custom EGG® tools, Big Green Egg Organic Lump Charcoal, and a summer's worth of free pork! Submit a mouth watering 140 character description of why yours is the best. 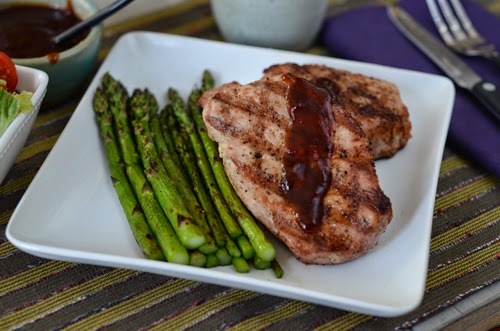 My pork chops are the Top Chop because the butter spiced rum injection makes them sinfully lip smackin’ luscious! So stop reading this, hop over to the Contest Entry page over at Pork Be Inspired and quickly enter. Go ahead....I'll wait. I wasn't kidding. Go do it, you DO want $15,000, a ton o' pork, and a Big Green Egg, don't you? Okay, back to those lip smackin' luscious pork chops...we loved these and they really did leave me licking my lips. 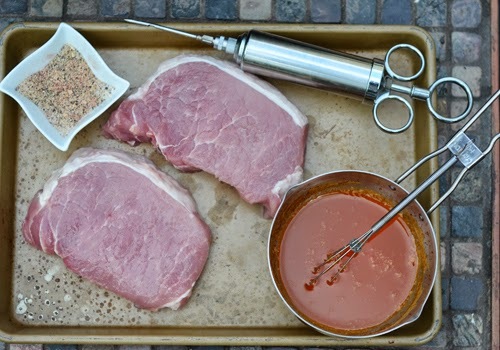 Brines and marinades are awesome at complimenting the flavor and juiciness of pork chops but they take time to work. Injecting works faster than you can say hypodermic needle! 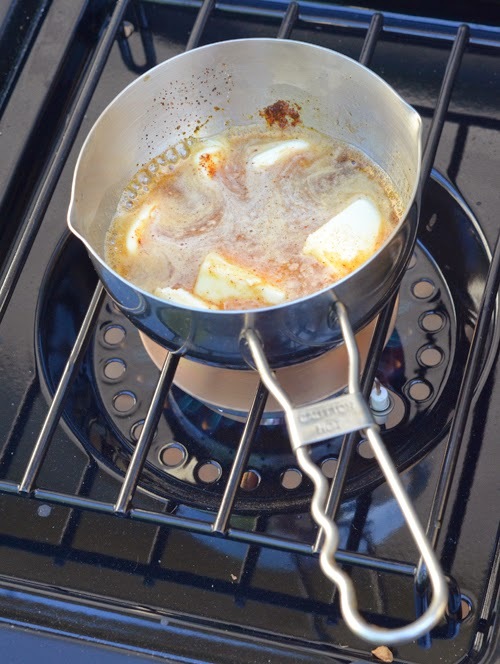 Melt the butter in a small saucepan over medium-low heat and stir in the remaining ingredients. Set to the side and allow to cool for a few minutes. Mix the rub ingredients together in a small bowl and set aside. 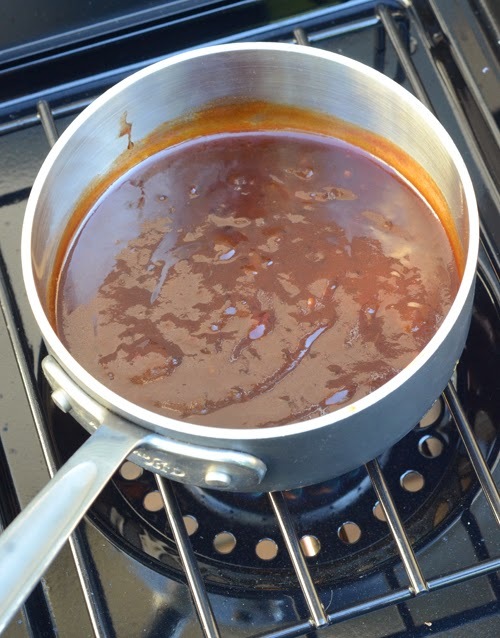 Stir the BBQ sauce and peach jalapeno jelly together in a medium sauce pan over medium heat until combined, just 3-5 minutes. Preheat your grill to medium high heat (450-500°F). 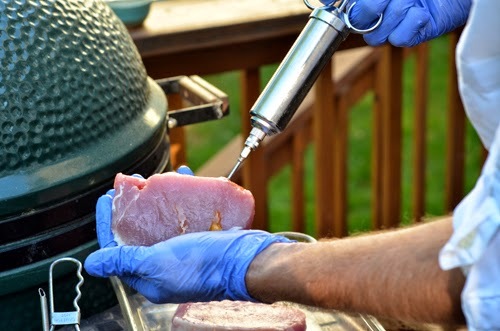 Using a meat syringe (see notes), draw up some of the butter rum and carefully inject each pork chop through the sides in 6-8 evenly spaced places. Slather the pork chops with any of the butter that leaks out. Season with the dry rub. 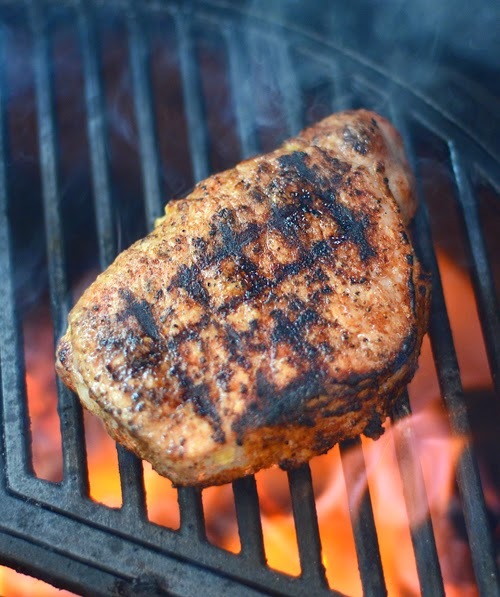 Grill the chops until they reach an internal temperature of 140°F, about 5 minutes per side. Remove from the grill (glaze if desired) and let rest for 5 minutes, then serve with the sauce on the side. 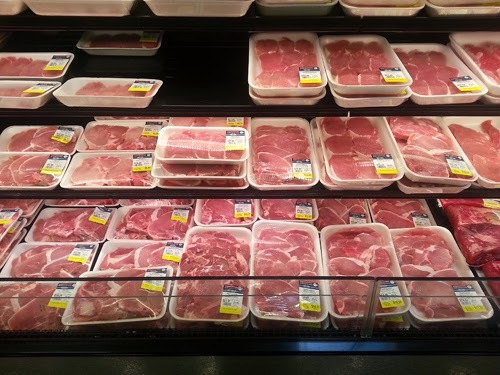 I headed to the nearest Kroger to grab some thick pork chops for my Top #ChopGriller example. 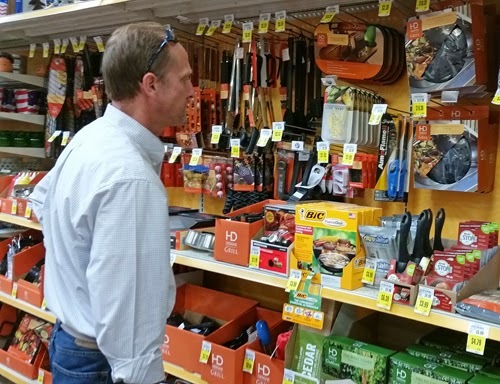 I have to give it to them, they are totally ready for grilling season and have everything your cookout needs, from the tender cuts of pork to even stocking grills! Before I can get 50 feet past the door, they had a display with a kamado grill, charcoal grill, and a Char-Broil TRU Infrared gas grill. That's convenient because this recipe works on any of these. When picking chops, I look for them to be "two fingers" thick with a nice red color. 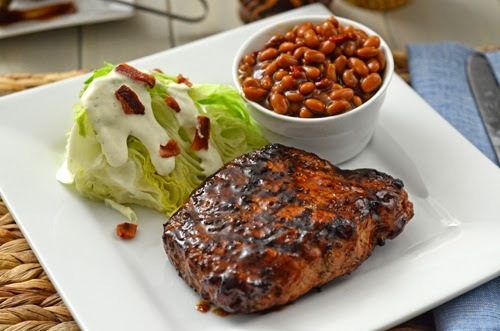 This recipe is written for using boneless ribeye pork chops but we have also used it on the boneless NY strip and the bone in ribeye with equally great results. Just make sure yours are at least 1" thick so you have plenty of space to inject. Making the injection mix on a side burner. Injection delivers immediate results, no waiting required. A stainless steel injector like mine is a great investment but if you're not sure, grab one of these low cost versions that comes with a jar of injection. 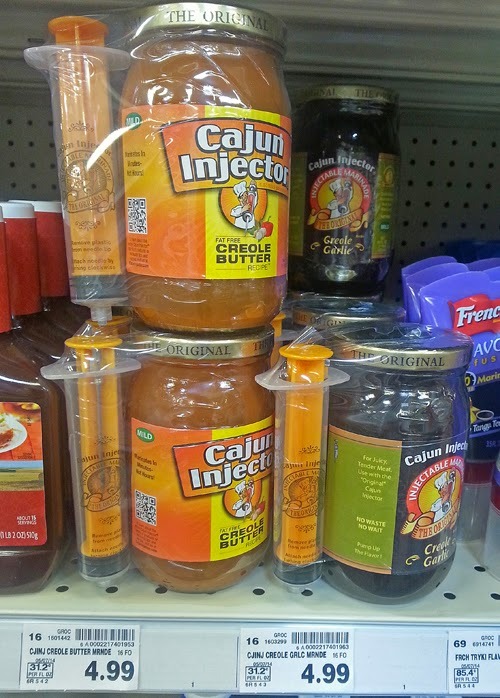 This was how I bought my first meat syringe. These are right next to the BBQ sauces at my Kroger. 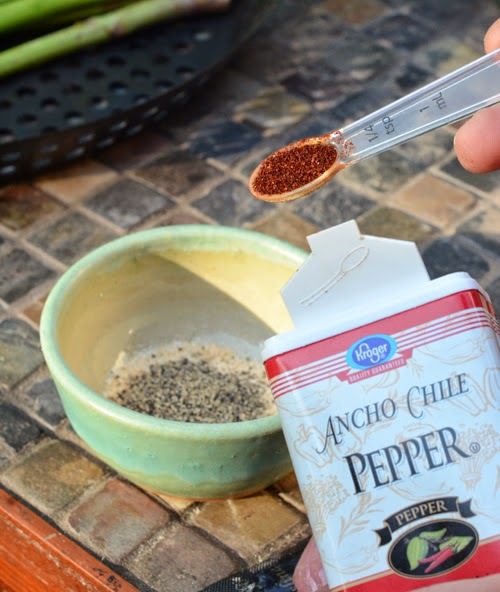 Ancho chile gives a smoky red chile flavor without the heat of cayenne or even chipotle. Very optional. Chunky as is or use an immersion blender for smooth. Don't use it at all, serve on the side, or glaze the entire chop. It's up to your preference. 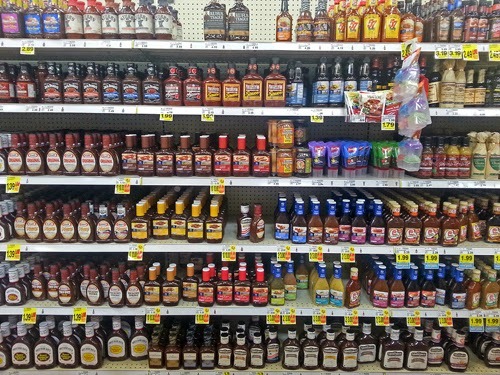 What kind of BBQ sauce? The options are up to you, but for this recipe I like using a smoky sweet sauce. Stick the needle in and then push down on the plunger as you draw the needle back out. You'll get some squirts here and there. No problem, that will be your slather to bind the rub to the chop. 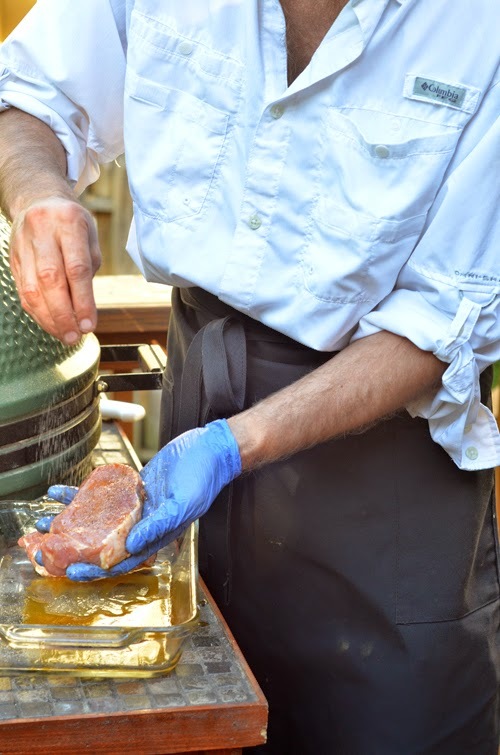 By seasoning from 6-8 inches above, you'll get more even distribution without clumps of spice on the meat. 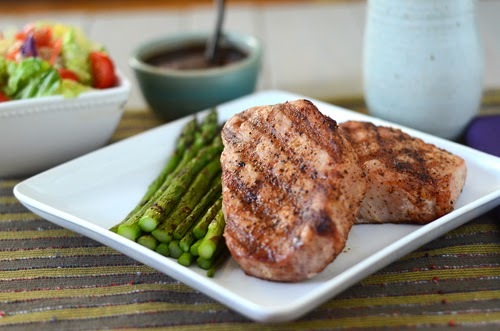 Pork chops are easy to cook, grill them just like a steak! Just don't overcook them. If you want cross-hatch marks, rotate the chops 1/4 turn half way through the cooking time of each side, about 2 1/2 minutes. Can you hear the sizzle and smell the smoke yet? Get the internal temperature between 145 degrees (medium rare) and 160°F (medium), followed by a 3 minute rest time. I'm a medium rare guy. Serve how YOU like it. We've made these three times now and everyone devoured them with high praise. Finger licking, lip smacking, and fan-freaking-tastic. 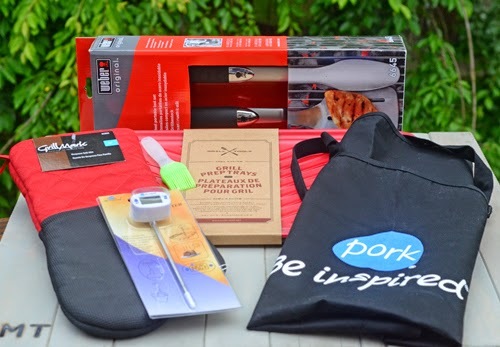 Kroger and the National Pork Board are giving one of my lucky readers the tools and gear to help grill delectable pork all summer long! Pork Be Inspired grilling apron - because things happen and when they do, it sounds like "splat!". 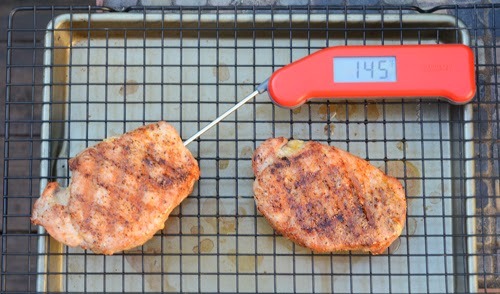 Pork Be Inspired digital thermometer - for ensuring your chops are perfectly done between 145°F and 160°F. Kroger Gift Card ($250 value) - so you don't have to decide between ribeye, porterhouse, or NY Strip pork chops....buy them all!!! Set of Grill Prep Trays - red for raw, brown for cooked food, never the twain shall meet. Set of quality stainless steel grilling tools. 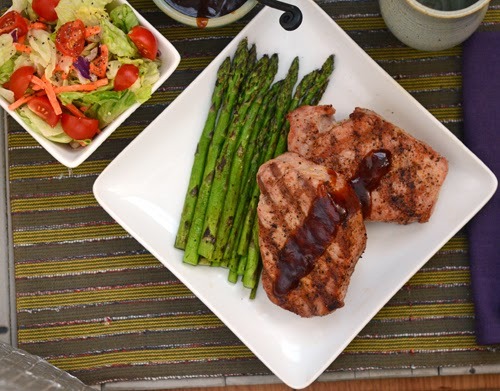 To enter, leave a comment below telling us your favorite cut of pork to grill. You can have a second entry for a tweet about this giveaway using the hashtag #NMTPorkGiveaway so I can find it. NOTE: If you are using the anonymous comment option, please make sure to leave a way to reach you (email, forum user name, etc) in case you win. Giveaway entry period begins as soon as this is posted and ends Friday, May 16th at 11:59pm. Drawing will be held Monday, May 19th at 7:00pm (All times are Eastern Time zone). Winner will be announced in an update to this post. The National Pork Board and Kroger are only sponsoring the prize. They are not responsible for the drawing or the giveaway. 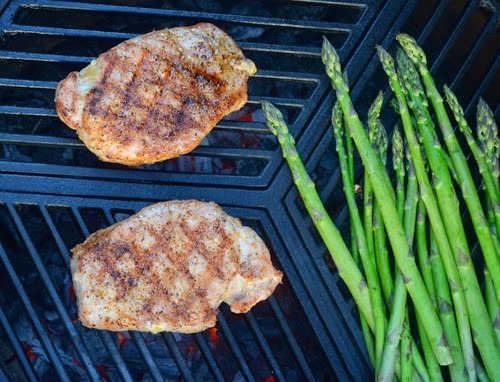 [Standard Disclaimer] This post is sponsored as part of Grilling with Kroger and the National Pork Board. Congratulations, Neddy, I'm sending you an email to get your shipping info.